Specification: Application:Indoor/Outdoor Power Consumption:6W Power Input:100-240V AC 50/60HZ 500mA Waterproof:IP44 Shell Material:PC Package Includes: 1 x LED Projector Light 1 x Power Supply Transformer 12 x Switchable Slides 1 x Ground Stake 1 x Base Note:If you insert a different slide,you may needto adjust distance for clarity. 1. 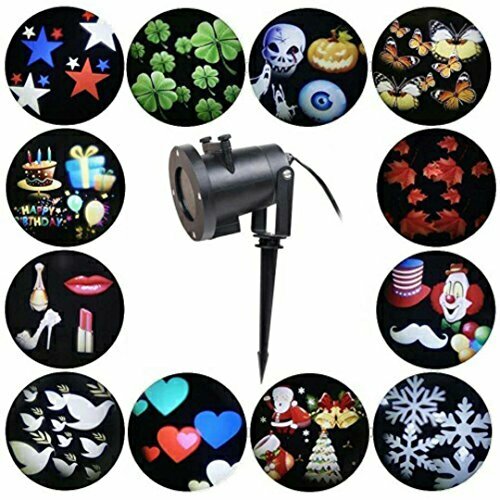 12 Patterns Led Projector Light-designed for many occasion . Xmas, Halloween , Birthday, New year , Valentines day, Thanksgiving Day, and other holidays. 2. Easy to Use & 2 mounting ways Suitable for Indoor and Outdoor --A sturdy base tripod for placing on the platform and a detachable ground stake for easy and stable position on the grass. Mounting bracket for adjusting lighting angle to get the best effect. 3. Wireless Remote Control & Automatic Timer.--With our wireless RF controller from up to 50ft away，you can change different modes such as on/off,flash+/Flash-,and moter+/motor-.you can also choose to use the remote control to change 2H, 4H, 6H auto turns off. If you have any questions about this product by Feemoo, contact us by completing and submitting the form below. If you are looking for a specif part number, please include it with your message.